Hydroponics is a method to grow plants without soil.As demand of food is increasing, we need to find ways to grow vegetables and fruits in whatever way possible. Why do we need Hydroponics way of irrigation? 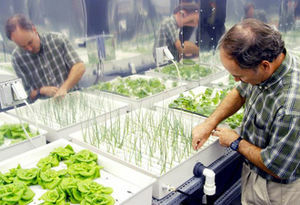 Limitation of land ,weather dependence and transportation cost are the factors because of which we should shift our focus from traditional methods to Hydroponic.Further more, we can grow more than one crop in same bag has great economic benefits.Research done by University of Florida found that this way of irrigation has profitable too. In the colder part of the world,it is difficult to grow plants in winter because of lack of sunlight and harsh weather conditions.This method can be used to mitigate these cumbersome problems. More plants per unit area. Water stays in the system and reusable. Do it yourself at home : This page contains method and procedure required.